The notable and the brilliant mind behind numerous bills for the nation, Miriam Defensor- Santiago died peacefully today at 8:52am. 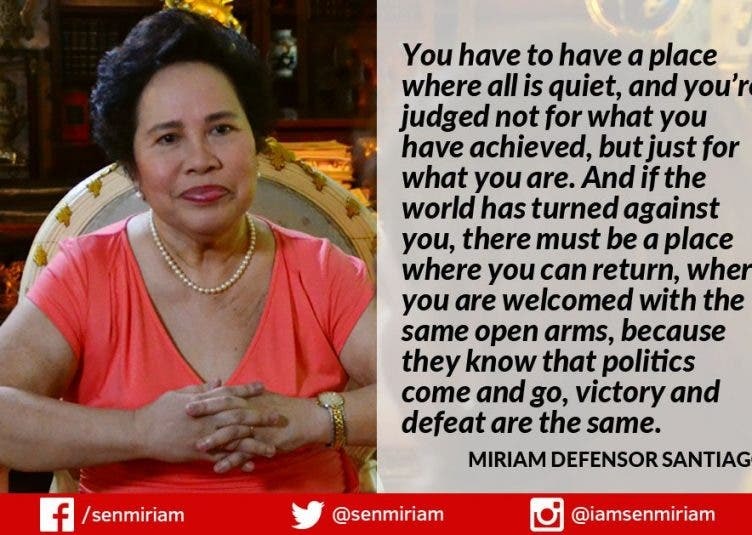 Former Senator Miriam Defensor- Santiago, succumbed to cancer at the age of 71. As mentioned by GMA News, she passed away while confined at the St. Luke’s Medical Center in Bonifacio Global City. Senator Miriam Defensor Santiago died peacefully today at 8:52am. Details of the interment will be announced later. We ask for prayers as her family goes through this difficult time. Miriam Defensor – Santiago authored many bills to improve the quality of life in the Philippines. Some of the bills she authored were: (1) Reproductive Health Act of 2012 (2) Sin Tax Law (3) Climate Change Act of 2009 (4) Renewable Energy Act of 2008 (5) Cybercrime Act of 2012, just to name a few. She had been battling cancer since 2014. Miriam Defensor- Santiago ran for president during the May 2016 elections but lost to President Rodrigo Duterte. She also tried her luck during 1992 and 1998 elections. Rest In Peace, Ma’am. You will be missed. Thank you for everything.